Fall 2019 fashion trends: Shoulders, classic prints and pockets! 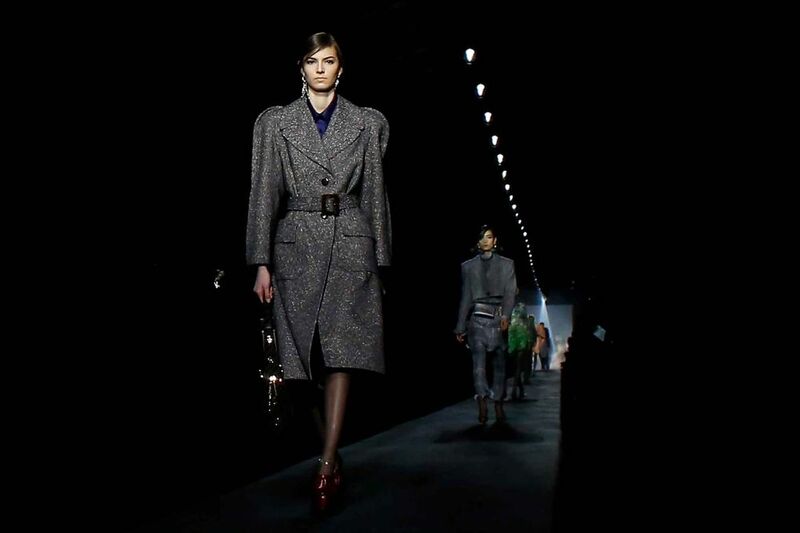 After catching the fall and winter 2019 runway collections in New York, London, Milan and Paris over the last month, it’s become abundantly clear that the era of easy-wearing, focus-pulling, power-dressing is upon us; from bright, near-neon colors and menswear-suiting-inspired patterns to the biggest, sharpest shoulders we’ve seen since the original “Dynasty” was on the air in the ’80s. Here is a closer look at five of the season’s standout trends and the luxury labels that did them best. This was one trend we noticed swishing and swaying from the runways of New York Fashion Week (where Christian Siriano envisioned an outer-space utopia full of wide-leg trousers, for example) all the way through to the final footfalls of Paris Fashion Week (where Chanel’s ski-themed collection included legs cut generously enough you could actually wear them with bulky ski boots — should you be so inclined). In between, fabric floating and flapping about the ankles could be spotted at Dolce & Gabbana (in the form of 1940s-sleepwear-inspired silhouettes), Stella McCartney, J.W. Anderson, Lanvin and Fendi. And at Celine, the relaxed trouser silhouette was there — albeit a few inches closer to the knee — thanks to lots and lots of culottes in fabrications that included denim, leather and herringbone tweed. No purse? No problem. There were so many multi-pocketed pieces to pick from on the runways this time around, you’ll definitely have the option of leaving the handbag at home and still have plenty of places to stash your essentials. In Max Mara’s “politics of glamour” collection, they took the form of both zippered, safari-like cargo pockets and large satchel-like bags at the waist. At Prada, they had a decidedly military-inspired vibe, and at Rick Owens’ homage to glam rock, cashmere coats were spliced with silver cowhide and patched with soft padded nylon cargo pockets. 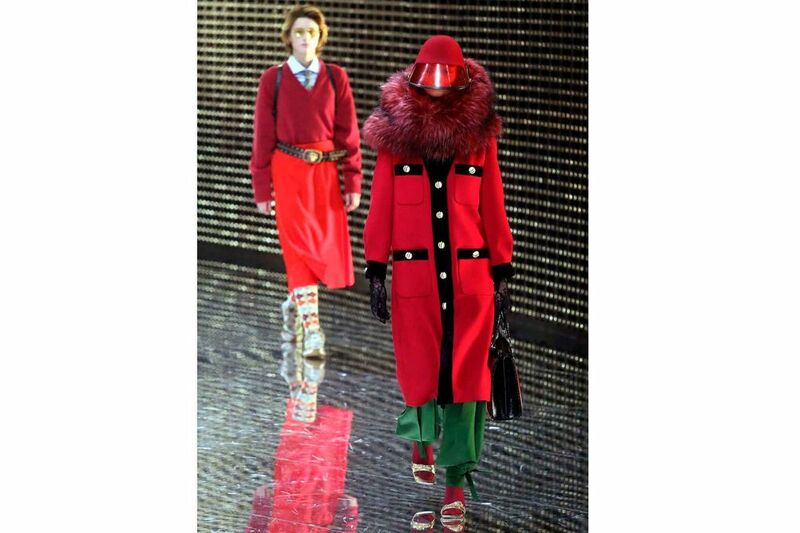 At Louis Vuitton, where the collection was inspired by the inside-out architecture of the Centre Pompidou, the pockets were neither outsized nor particularly numerous, but attention was drawn to their presence thanks to the models who walked the runway with their hands jammed resolutely into the front-of-the-hip pockets of skirts and dresses. 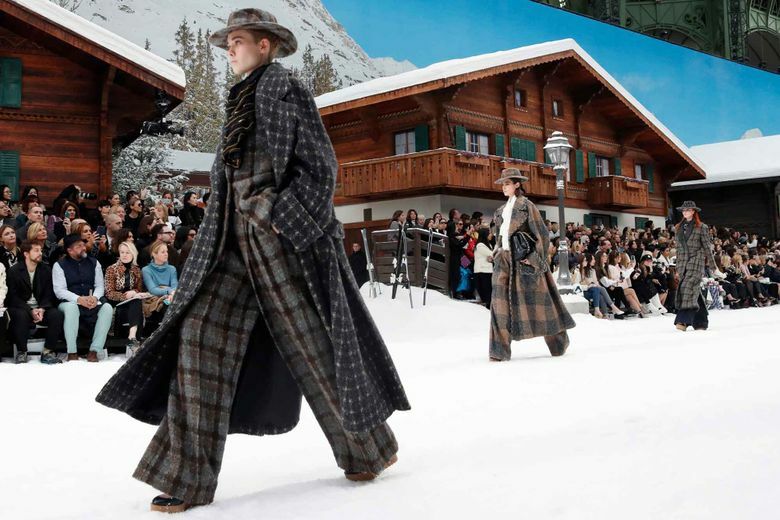 Silhouettes and fabrics traditionally associated with men’s suits were all over the runways this season, with glen plaids, pinstripes, windowpane checks and a particularly deep bench of houndstooth checks out in force. 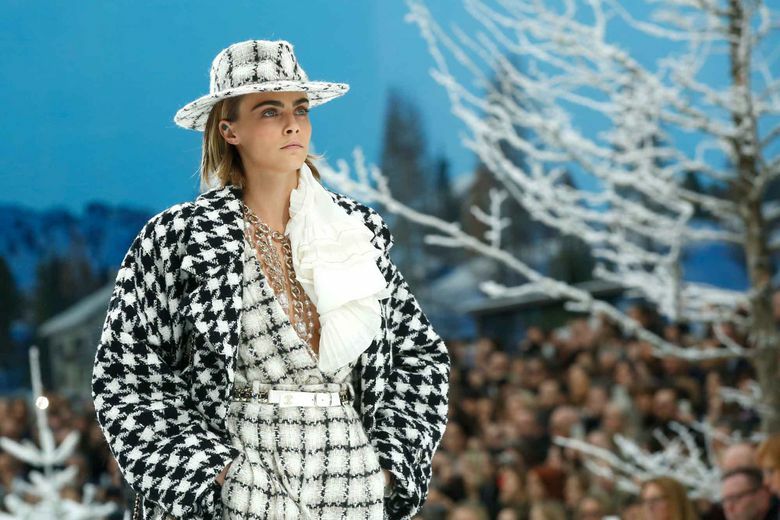 At Balmain, Olivier Rousteing used the bold geometric of the houndstooth as part of his spike-filled homage to the female troublemaker, and exploded versions of the pattern turned heads at Dolce & Gabbana in the form of peak-lapel tuxedo jackets that nipped in elegantly at the waist as well as at Chanel where it graced long, tweedy overcoats, wide-legged pantsuits and western-style hats. 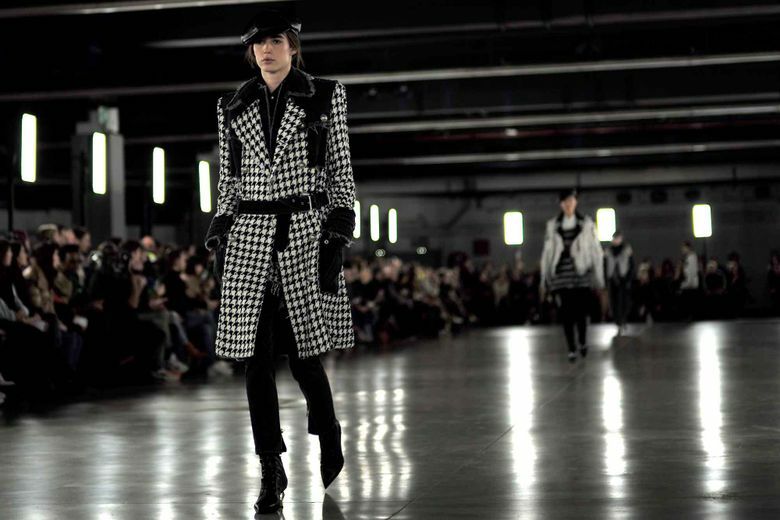 At Dior, there was a stampede of buffalo plaid pieces, and at Alexander McQueen, where the collection was inspired by a trip to the mill towns of northern England, the runway included a black leather trench coat with side panels in a red-and-black exploded Prince of Wales check and a sharp-shouldered menswear-inspired coat in a black-and-white version of the same pattern. Adding to the feeling that menswear suiting fabrics were, indeed, everywhere were the suits at the McQueen show, which were immense, industrial-sized rolls of charcoal gray worsted wool and black pinstripes plucked from the British mills used by the label. Although the multiplicity of menswear influences meant that combinations of black, white and gray were the big color story of the season, when designers did turn to the brighter shades of the spectrum, they did so in a way that was impossible to miss. At New York Fashion Week, Kate Spade spun the color wheel through shades of pale pink and lilac purple. By the time Gucci kicked off Milan Fashion Week, dresses were fire-engine red — accessorized with handbags of cotton-candy pink no less — with the latter color cropping up repeatedly at Dolce & Gabbana as well. 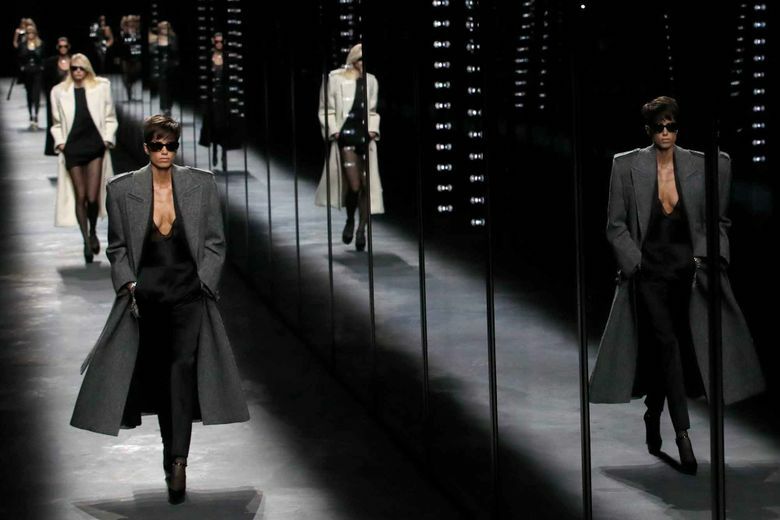 And in Paris, the shades were even brighter, bolder and more intense, with full-on fuchsia looks pulling focus at Rick Owens, Chanel, Alexander McQueen and Jacquemus, among others. However, two labels in particular managed to make an indelible impression on the optic nerves — Dries Van Noten and Balenciaga. 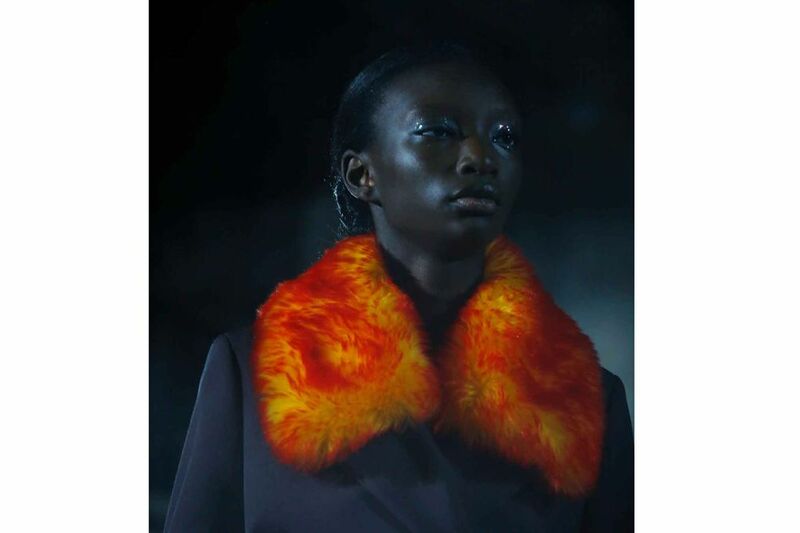 The fall and winter floral-inspired collection of the former included a range of shimmering faux-fur pieces in neon orange, including a handbag and a shoulder wrap, that approximated the look of wearable embers. The latter served up a range of neon brights, including yellow overcoats and moire silk dresses; flamingo-pink, graffiti-print mini-dresses; and suits and separates in candy-apple red. At some labels, like Fendi, the defined shoulder seemed to manifest itself almost casually, balanced by tall collars and looping bows. Elsewhere, the sharp shoulder seemed to be the point and nothing but the point. Nowhere was that more apparent than Saint Laurent, where the entire fall and winter 2019 lesson in angularity felt balanced on the broad points of the sharpest shoulders in Paris. Will it turn out to be as big at the register as it has been on the runway? Only time will tell. However, one thing is for sure: if the strong shoulder does end up making a strong showing, we’ll probably be able to see it coming from miles away.